A London council has taken an average of £1,400 in parking fines per day from a single loading bay, it has emerged. Over 20 months 10,000 fines were incurred at the St Margarets Road bay in Twickenham, south-west London. Driver Lucio Milisci, who was fined three times for using the bay, said: "The signs are not clear enough." Richmond councillor David Trigg admitted the number of fines from the bay was "high" but denied that the signs were confusing. Mr Trigg said: "The number of fines here was very high when we first put this in place but it has tailed off considerably now." 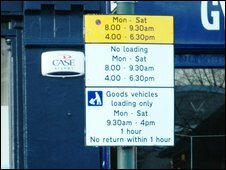 He added: "There are now no more fines here than any other loading bay in the borough." Mr Trigg denied that drivers were being fined automatically after being filmed on CCTV while examining the bay's signs. "If you are just there for a short time to look at the signage then you are not going to receive a ticket, it wouldn't be reasonable," he said. Richmond Council took £3.2m in parking fines across the borough over the past year. Parking fines raised a total of approximately £220m per year for London councils between 2005 and 2007. What are the new parking laws about?